Lauri, also known as the king of snippets, is a core member of our development team and is focused on front-end development. 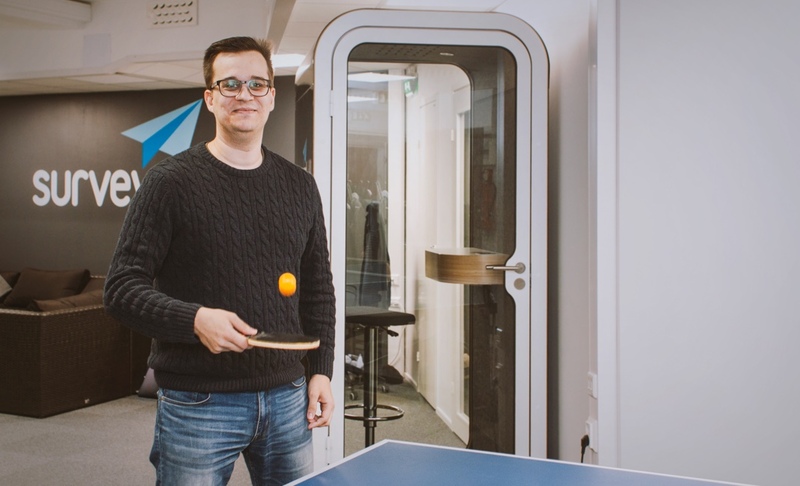 This JS mastermind is also a competitive ping pong player. This is Lauri’s story. Hi, I'm Lauri. I work as a front-end developer for Surveypal, in Tampere, Finland. My job is to make sure that front-end code works as intended and all related technologies are up to date. My daily responsibilities, also, include the execution of new features. I joined Surveypal almost two years ago, after completing my bachelor’s degree in Computer Science. This is my first job as a front-end specialist and working here has taught me a lot. Once you start dealing with real software you come to terms with its complexity. Those are the things they don’t teach you at school and I appreciate the challenge of solving real problems that affect real people. Working at Surveypal is fun. We laugh and joke a lot and, to me, that is important. We trust and depend on each other and I can easily ask help or input from my colleagues. There is a strong feedback culture within the company which benefits everybody. The best part of my job is that I can create my own code and observe how it improves the software. Once you familiarize yourself with the software, you develop a better understanding of it and become more aware of how your own work affects it. At Surveypal, we are expected to take responsibility for our work but, at the same time, we are granted with the freedom to choose how to work. The team leader, obviously, helps with task prioritization but, at the end of the day, it is up to you to decide how to complete the task at hand. You can get creative because you are trusted to know how to do your job. The way I see it, team work is a mixture of freedom and responsibility that is glued together with trust. A few weeks ago, I started finalizing my master’s thesis project. That meant I had to cut back on my work hours for a few months. I was encouraged to graduate and had the option to switch to working part-time for a few months. It is great to have that kind of flexibility. Surveypal treats employees as individuals and not just as hands that write code.